For four days straight, the San Francisco Bay Area community blocked the Israeli ZIM ship from unloading at the SSA. And today, we salute the rank and file workers of ILWU, Local 10 for standing with us against Israeli Apartheid by honoring our pickets and letting the ship go from the SSA terminal yesterday afternoon! Saturday, we mobilized thousands of our community to show the world that Oakland does not welcome racism, apartheid or Zionism, from Ferguson to Palestine. We flooded the streets and marched towards the Port only to discover that the ZIM ship decided to stay at sea rather than dock and be confronted by the power of our numbers. The ship attempted to dock and unload on Sunday, but within a half hour hundreds of us organized community pickets requesting that workers to stand with us on the side of justice and not unload the Apartheid ship. And as ILWU rank and file always have, and as they did during South African Apartheid, they demonstrated their solidarity with the global fight against oppression and honored our picket. The following Monday and Tuesday saw both an organized call to action as well as autonomous protests determined to keep the ship from being unloaded. These efforts coupled with worker solidarity continued the success of the weekend’s total blockade of the ZIM ship. 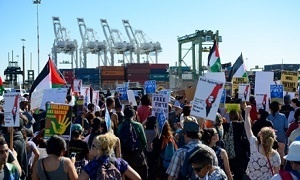 Tuesday we declared a historic victory for Palestine as Oakland held down the longest blockade of an Israeli ship. Not only did we block the boat, but we also showed the world that racist exclusionary state of Apartheid Israel has no place on our port, and will soon find that it has no place on any port on the West Coast. After being blocked from unloading at the SSA Terminal, the ZIM ship was forced to leave and unload at another Terminal where it was met with protests by autonomous activists. This even further delayed the unloading of the ship. From the use of tear gas to the training of police by Israeli military, Oakland feels firsthand the brutality of Israeli war-making. And Palestine knows too well the role the U.S. plays in facilitating the ongoing ethnic cleansing of the indigenous Palestinian people. From the policing and militarization of our local communities perfected with Israeli tactics of repression to the billions that the U.S. provides Apartheid Israel, the connections are clear and are made for us. And over the last four days we showed the world that we stand shoulder to shoulder from Palestine to Oakland to Ferguson as we struggle to bring down every wall, every Apartheid system and every racist state.